TARRYTOWN - It seems a stretch to call the blocks of rock that make up the village train station building pink granite and red sandstone, by the way they're blackened with years of soot and grime. The building has changed little since it was built almost 120 years ago, but the decay, and plywood boxes holding metal posts that support the overhang, make it difficult to imagine just what it looked like then. But wait a few months and look again. Metro-North Railroad, despite the financial troubles striking its parent agency, and despite the country's economic mess, will renovate the 1890 building, a village landmark, with work set to start any day. The $1.7 million project is a small piece of the $35 million that the railroad had expected to spend to spruce up the building and work on the platforms, staircases, elevators and overpasses. That work, like construction projects all over, has been delayed by the economic problems. But plans for it are prepared enough for the project to be eligible for stimulus funding, which goes to so-called "shovel-ready" projects, Metro-North spokeswoman Marjorie Anders said. This morning I found the west side (track side) of the station building completely closed off and barricaded. I had to walk around to the east side (parking lot side) to get inside and buy coffee and a paper. Then I exited and got on the Bee-Line bus. Journal-News wrote: ...train station's pink granite and red sandstone...blackened with years of soot and grime. The building has changed little since it was built almost 120 years ago, but the decay, and plywood boxes holding metal posts that support the overhang, make it difficult to imagine just what it looked like then. I use the station about six days a week and I don't think the above is totally accurate. The building was actually renovated -- with some fanfare -- about 10-12 years ago. The exterior was cleaned, the interior woodwork (floors, walls) was renewed, lighting was improved, the bathrooms were redone and (I think) some repairs were done to the shingled roof. For awhile we even had an agent on duty on Saturdays up until about 1 o'clock. I also don't agree the pink granite and red sandstone exterior are "blackened with years of soot and grime." I paid special notice to the exterior on my way home this evening and they look pretty good. Okay they could use a cleaning. The shabbiest part of the station has always been the old concrete westbound platform -- the part that still exists, directly in front of the station house -- the concrete surface does seem kind of dirty and is not very well lit. About 6 or 7 years ago the wooden columns supporting the old platform canopy were inspected and found inadequate. As the article states, box-type supports were erected around the columns' base and metal supporting rods were added for stabilty. This is the portion that is now blocked and tarped off. It's about damn time!! I mean that station in places looks like it is on the verge of a total crumble, not to mention the Track 3 side (northbound) and the Track2/4 platform have some wicked gaps, and the Track 2 side has quite a level-uneven issue, with the platform being quite a bit lower than the step plates at the car vestibules. I always make an extra announcement of caution to all passengers exiting. Yeah, Tarrytown needs a remodel job completely, and good to see it will finally get it. Ossining looks like it's coming out good (Track4/2 side), hope Tarrytown looks as good. MNR's #1 Conductor wrote: I mean that station in places looks like it is on the verge of a total crumble. You're talking about the platforms, I was talking about the stationhouse. But honestly, I think I figured one time I've boarded or gotten off a couple thousand trains there since 1991, I never really gave the platform conditions a thought. They seem fine to me. The one place you do have to be alert -- you can't be gabbing on the cell phone and walking on auto-pilot -- is on the north end of Tk 3 where the track is beginning to curve. 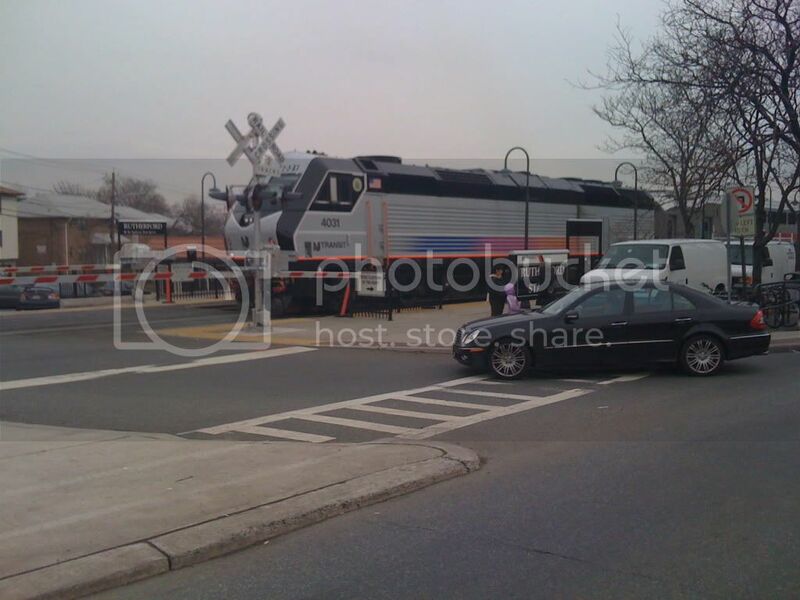 The cars are leaning slightly away from the platform. The other item that really needs work is the north stairwells and overpass. There's some spots on the stairs where the rusting has left visible holes where you can see clear through to the ground below. The other stairwells aren't as bad, but I believe they are newer. Were getting things confused here, The renovation is on historic station building, no mention of platforms. Despite this being same to railfans , it is not. DutchRailnut wrote: ....no mention of platforms. Despite this being same to railfans, it is not. Well they did mention it. And despite your usual potshot at us railfans, it was a fellow employee of yours who was first to bring up the issue of platforms. Btw, I use the north stairwell all the time and I'm not aware of any spots where they're rusted completely through. The work being done yesterday (Thurs 5/14) was on the west side of the station's steeply peaked roof. I think they have most of the old shingles off and are ready to put the new ones in. It looks like they're adding some waterproofing too. There may be a materials issue as well, some material being removed from the roof. And for you stairwell buffs out there, I paid special attention to the north stairwells last night. (Meaning I passed on taking the elevators. ) There are no rusted through areas. The steps and landings are actually covered in a hard-rubber (looks like concrete) material, that is both longlasting and non-skid. It was installed several years ago and has held up well. The building is a gem that has been in continuous use since it was built in 1890 by the New York Central and Hudson River Railroad. It received a new slate roof, gutters, and canopy supports. Three dormer windows that had been sliced off decades ago during a prior roof job were reconstructed and now the afternoon sunlight brightens the waiting room with its terracotta tile floor and oak benches. Outside in front, the roof overhang on the eastern façade, which had been truncated to accommodate the height of buses at the curb, was restored to its original dimensions and the sidewalk was widened. Metro-North will reserve exclusive use of the ticket office, as well as nonexclusive use of a public waiting area and public restrooms. Depending upon the requirements of the lessee, the public areas may be either incorporated into or segregated from the proposed commercial use. The lessee will be required to provide morning coffee service on business days from 6:00 a.m. – 11:00 a.m., at a minimum. The suggested rent is $50,000 a year with annual increases of 3%. The renovated station will have a restaurant, bakery and improved waiting area. TARRYTOWN, NY — MTA Metro-North Railroad announced Wednesday that the Tarrytown Station House will be reinvigorated, becoming a more vibrant, welcoming place for commuters and residents alike. The Bakehouse Inc., a well-known bakery located in Ardsley, will bring a full-service bakery and restaurant to the station house. This new venture will be both a traditional bakery and a café-restaurant with take-out and sit-down menus. The ticket office will remain at the station house, along with the public use of the waiting area and bathrooms. The station building is currently underutilized, housing a ticket agent booth and small concession stand, according to Metro-North. Under the proposed plan, the interior will be reconfigured and refurbished. A new seating area will be installed near the ticket window, creating a more appealing waiting area for over 3,200 customers who board trains at the station on an average weekday. Early morning commuters will be able to enjoy the convenience of a full coffee bar and breakfast items right at the station. A large counter area will have display cases for cakes, pies, cookies, breakfast items and breads, and nearby informal seating will cater to customers on the go.